Music and other merchandise from the award-winning activist duo who will perform at this year’s festival. A folk musician’s favorite since 1974. Now open in Berkeley! aka The Thin Man, selling and restoring/repairing new and used string instruments of all types. Interested in being a festival vendor? Contact our vendor coordinator at sffff-vendor@googlegroups.com . Our current terms are: 5% of everything sold over $100, plus purchase a 1/4 page or larger ad in our program at the special vendor rate. Artwork for ads will be due in late April or early May. If you apply to be a vendor after the deadline, you will be asked to pay the full ad rate as an administrative fee. Food vendors, please contact the festival director . A new generation of pickups – the only pickup line you need. 100% made in the USA. Come by today and hear it for yourself. A small wooden drum that fits in your lap. These drums are hand crafted. Stop by and try one. aka The Thin Man, selling and restoring/repairing new and used string instruments of all types! 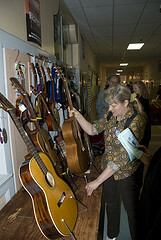 Mandarangos, Ukubanjos, Gittars and other wondrous items. Beautiful handmade garments that are soft, breathable and warm – scarves, shawls, sweater, and more. The alpaca fiber is the easiest of fibers to dye, resulting in a tremendously rich looking yarn. Independent, non-profit publisher of books and media on music, culture, art and history, based in the Bay Area. Books on folk music, the historical labor and political roots of much of the music, and some folk CDs. And our 2018 food vendor: Beyond the Border! 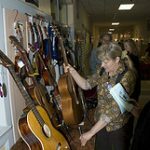 Supplying the City with musical instruments, accessories, and lessons. Come see what they have to offer at the festival. Lifelike creatures – real and fantastic – made of unspun wool and steel wire for costume accessories or decorations. Picture a mouse or a little dragon or a frog on your shoulder or your hat…. Stop by to watch the all-day demonstration of the craft of needle felting – or give it a try yourself! A line of handcrafted toiletries and body care products specially formulated by a certified aromatherapist. Each product is made by hand in small batches with the finest natural ingredients to assure freshness and quality. aka The Thinman, selling and restoring/repairing new and used string instruments of all types! Mandarangos, Ukubanjos, Gittars and other wondrous items. Dance/Hula Hoops for adults and children – learn, play! Creature Features are Fantasy Animal Ears Hair Clips and headbands, feather hair extensions, butterfly wings, floral crowns. Festie, Fantasy, Fairy, Fun! Best Gyros and Chicken Shish kebab on wheels! Bringing the East Coast meets Eastern Europe to California with humor and humility. A variety of tacos, burritos, tortas and quesadillas.